Structured Streaming is a scalable and fault-tolerant stream processing engine built on the Spark SQL engine. You can express your streaming computation the same way you would express a batch computation on static data. The Spark SQL engine will take care of running it incrementally and continuously and updating the final result as streaming data continues to arrive. You can use the Dataset/DataFrame API in Scala, Java, Python or R to express streaming aggregations, event-time windows, stream-to-batch joins, etc. The computation is executed on the same optimized Spark SQL engine. Finally, the system ensures end-to-end exactly-once fault-tolerance guarantees through checkpointing and Write Ahead Logs. In short, Structured Streaming provides fast, scalable, fault-tolerant, end-to-end exactly-once stream processing without the user having to reason about streaming. In this guide, we are going to walk you through the programming model and the APIs. First, let’s start with a simple example - a streaming word count. Let’s say you want to maintain a running word count of text data received from a data server listening on a TCP socket. Let’s see how you can express this using Structured Streaming. You can see the full code in Scala/Java/Python/R. And if you download Spark, you can directly run the example. In any case, let’s walk through the example step-by-step and understand how it works. First, we have to import the necessary classes and create a local SparkSession, the starting point of all functionalities related to Spark. Next, let’s create a streaming DataFrame that represents text data received from a server listening on localhost:9999, and transform the DataFrame to calculate word counts. This lines DataFrame represents an unbounded table containing the streaming text data. This table contains one column of strings named “value”, and each line in the streaming text data becomes a row in the table. Note, that this is not currently receiving any data as we are just setting up the transformation, and have not yet started it. Next, we have converted the DataFrame to a Dataset of String using .as[String], so that we can apply the flatMap operation to split each line into multiple words. The resultant words Dataset contains all the words. Finally, we have defined the wordCounts DataFrame by grouping by the unique values in the Dataset and counting them. Note that this is a streaming DataFrame which represents the running word counts of the stream. This lines DataFrame represents an unbounded table containing the streaming text data. This table contains one column of strings named “value”, and each line in the streaming text data becomes a row in the table. Note, that this is not currently receiving any data as we are just setting up the transformation, and have not yet started it. Next, we have converted the DataFrame to a Dataset of String using .as(Encoders.STRING()), so that we can apply the flatMap operation to split each line into multiple words. The resultant words Dataset contains all the words. Finally, we have defined the wordCounts DataFrame by grouping by the unique values in the Dataset and counting them. Note that this is a streaming DataFrame which represents the running word counts of the stream. This lines DataFrame represents an unbounded table containing the streaming text data. This table contains one column of strings named “value”, and each line in the streaming text data becomes a row in the table. Note, that this is not currently receiving any data as we are just setting up the transformation, and have not yet started it. Next, we have used two built-in SQL functions - split and explode, to split each line into multiple rows with a word each. In addition, we use the function alias to name the new column as “word”. Finally, we have defined the wordCounts DataFrame by grouping by the unique values in the Dataset and counting them. Note that this is a streaming DataFrame which represents the running word counts of the stream. This lines SparkDataFrame represents an unbounded table containing the streaming text data. This table contains one column of strings named “value”, and each line in the streaming text data becomes a row in the table. Note, that this is not currently receiving any data as we are just setting up the transformation, and have not yet started it. Next, we have a SQL expression with two SQL functions - split and explode, to split each line into multiple rows with a word each. In addition, we name the new column as “word”. Finally, we have defined the wordCounts SparkDataFrame by grouping by the unique values in the SparkDataFrame and counting them. 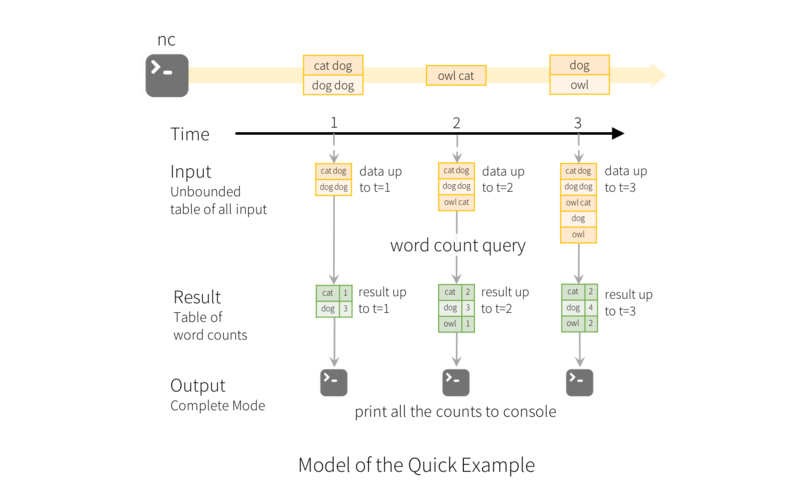 Note that this is a streaming SparkDataFrame which represents the running word counts of the stream. We have now set up the query on the streaming data. All that is left is to actually start receiving data and computing the counts. To do this, we set it up to print the complete set of counts (specified by outputMode("complete")) to the console every time they are updated. And then start the streaming computation using start(). After this code is executed, the streaming computation will have started in the background. The query object is a handle to that active streaming query, and we have decided to wait for the termination of the query using awaitTermination() to prevent the process from exiting while the query is active. The key idea in Structured Streaming is to treat a live data stream as a table that is being continuously appended. This leads to a new stream processing model that is very similar to a batch processing model. You will express your streaming computation as standard batch-like query as on a static table, and Spark runs it as an incremental query on the unbounded input table. Let’s understand this model in more detail. Consider the input data stream as the “Input Table”. Every data item that is arriving on the stream is like a new row being appended to the Input Table. A query on the input will generate the “Result Table”. Every trigger interval (say, every 1 second), new rows get appended to the Input Table, which eventually updates the Result Table. Whenever the result table gets updated, we would want to write the changed result rows to an external sink. Complete Mode - The entire updated Result Table will be written to the external storage. It is up to the storage connector to decide how to handle writing of the entire table. Append Mode - Only the new rows appended in the Result Table since the last trigger will be written to the external storage. This is applicable only on the queries where existing rows in the Result Table are not expected to change. Update Mode - Only the rows that were updated in the Result Table since the last trigger will be written to the external storage (available since Spark 2.1.1). Note that this is different from the Complete Mode in that this mode only outputs the rows that have changed since the last trigger. If the query doesn’t contain aggregations, it will be equivalent to Append mode. Note that each mode is applicable on certain types of queries. This is discussed in detail later. To illustrate the use of this model, let’s understand the model in context of the Quick Example above. The first lines DataFrame is the input table, and the final wordCounts DataFrame is the result table. Note that the query on streaming lines DataFrame to generate wordCounts is exactly the same as it would be a static DataFrame. However, when this query is started, Spark will continuously check for new data from the socket connection. If there is new data, Spark will run an “incremental” query that combines the previous running counts with the new data to compute updated counts, as shown below. Note that Structured Streaming does not materialize the entire table. It reads the latest available data from the streaming data source, processes it incrementally to update the result, and then discards the source data. It only keeps around the minimal intermediate state data as required to update the result (e.g. intermediate counts in the earlier example). This model is significantly different from many other stream processing engines. Many streaming systems require the user to maintain running aggregations themselves, thus having to reason about fault-tolerance, and data consistency (at-least-once, or at-most-once, or exactly-once). In this model, Spark is responsible for updating the Result Table when there is new data, thus relieving the users from reasoning about it. As an example, let’s see how this model handles event-time based processing and late arriving data. 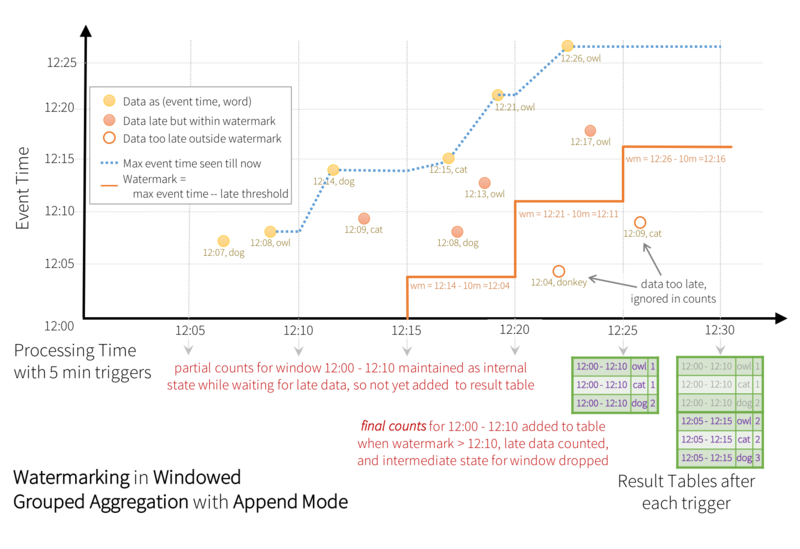 Event-time is the time embedded in the data itself. For many applications, you may want to operate on this event-time. For example, if you want to get the number of events generated by IoT devices every minute, then you probably want to use the time when the data was generated (that is, event-time in the data), rather than the time Spark receives them. 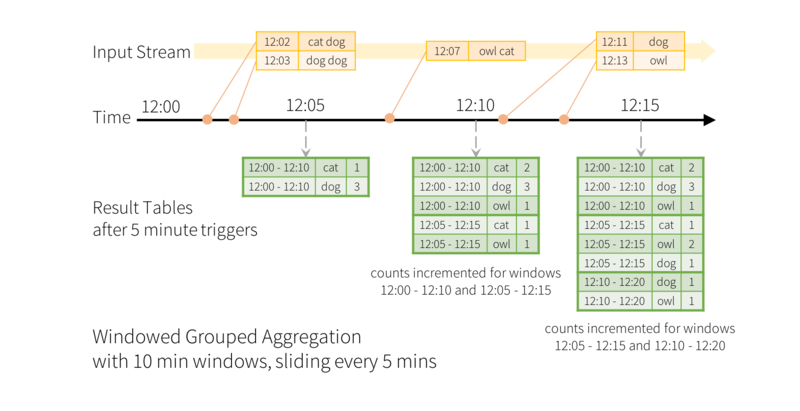 This event-time is very naturally expressed in this model – each event from the devices is a row in the table, and event-time is a column value in the row. This allows window-based aggregations (e.g. number of events every minute) to be just a special type of grouping and aggregation on the event-time column – each time window is a group and each row can belong to multiple windows/groups. Therefore, such event-time-window-based aggregation queries can be defined consistently on both a static dataset (e.g. from collected device events logs) as well as on a data stream, making the life of the user much easier. Furthermore, this model naturally handles data that has arrived later than expected based on its event-time. Since Spark is updating the Result Table, it has full control over updating old aggregates when there is late data, as well as cleaning up old aggregates to limit the size of intermediate state data. Since Spark 2.1, we have support for watermarking which allows the user to specify the threshold of late data, and allows the engine to accordingly clean up old state. These are explained later in more detail in the Window Operations section. Delivering end-to-end exactly-once semantics was one of key goals behind the design of Structured Streaming. To achieve that, we have designed the Structured Streaming sources, the sinks and the execution engine to reliably track the exact progress of the processing so that it can handle any kind of failure by restarting and/or reprocessing. Every streaming source is assumed to have offsets (similar to Kafka offsets, or Kinesis sequence numbers) to track the read position in the stream. The engine uses checkpointing and write ahead logs to record the offset range of the data being processed in each trigger. The streaming sinks are designed to be idempotent for handling reprocessing. Together, using replayable sources and idempotent sinks, Structured Streaming can ensure end-to-end exactly-once semantics under any failure. Since Spark 2.0, DataFrames and Datasets can represent static, bounded data, as well as streaming, unbounded data. Similar to static Datasets/DataFrames, you can use the common entry point SparkSession (Scala/Java/Python/R docs) to create streaming DataFrames/Datasets from streaming sources, and apply the same operations on them as static DataFrames/Datasets. If you are not familiar with Datasets/DataFrames, you are strongly advised to familiarize yourself with them using the DataFrame/Dataset Programming Guide. Streaming DataFrames can be created through the DataStreamReader interface (Scala/Java/Python docs) returned by SparkSession.readStream(). In R, with the read.stream() method. Similar to the read interface for creating static DataFrame, you can specify the details of the source – data format, schema, options, etc. There are a few built-in sources. File source - Reads files written in a directory as a stream of data. Supported file formats are text, csv, json, parquet. See the docs of the DataStreamReader interface for a more up-to-date list, and supported options for each file format. Note that the files must be atomically placed in the given directory, which in most file systems, can be achieved by file move operations. Kafka source - Reads data from Kafka. It’s compatible with Kafka broker versions 0.10.0 or higher. See the Kafka Integration Guide for more details. Socket source (for testing) - Reads UTF8 text data from a socket connection. The listening server socket is at the driver. Note that this should be used only for testing as this does not provide end-to-end fault-tolerance guarantees. Rate source (for testing) - Generates data at the specified number of rows per second, each output row contains a timestamp and value. Where timestamp is a Timestamp type containing the time of message dispatch, and value is of Long type containing the message count, starting from 0 as the first row. This source is intended for testing and benchmarking. Some sources are not fault-tolerant because they do not guarantee that data can be replayed using checkpointed offsets after a failure. See the earlier section on fault-tolerance semantics. Here are the details of all the sources in Spark. File source path: path to the input directory, and common to all file formats. For file-format-specific options, see the related methods in DataStreamReader (Scala/Java/Python/R). E.g. for "parquet" format options see DataStreamReader.parquet(). In addition, there are session configurations that affect certain file-formats. See the SQL Programming Guide for more details. E.g., for "parquet", see Parquet configuration section. Yes Supports glob paths, but does not support multiple comma-separated paths/globs. Rate Source rowsPerSecond (e.g. 100, default: 1): How many rows should be generated per second. rampUpTime (e.g. 5s, default: 0s): How long to ramp up before the generating speed becomes rowsPerSecond. Using finer granularities than seconds will be truncated to integer seconds. numPartitions (e.g. 10, default: Spark's default parallelism): The partition number for the generated rows. These examples generate streaming DataFrames that are untyped, meaning that the schema of the DataFrame is not checked at compile time, only checked at runtime when the query is submitted. Some operations like map, flatMap, etc. need the type to be known at compile time. To do those, you can convert these untyped streaming DataFrames to typed streaming Datasets using the same methods as static DataFrame. See the SQL Programming Guide for more details. Additionally, more details on the supported streaming sources are discussed later in the document. By default, Structured Streaming from file based sources requires you to specify the schema, rather than rely on Spark to infer it automatically. This restriction ensures a consistent schema will be used for the streaming query, even in the case of failures. For ad-hoc use cases, you can reenable schema inference by setting spark.sql.streaming.schemaInference to true. Partition discovery does occur when subdirectories that are named /key=value/ are present and listing will automatically recurse into these directories. If these columns appear in the user provided schema, they will be filled in by Spark based on the path of the file being read. The directories that make up the partitioning scheme must be present when the query starts and must remain static. For example, it is okay to add /data/year=2016/ when /data/year=2015/ was present, but it is invalid to change the partitioning column (i.e. by creating the directory /data/date=2016-04-17/). You can apply all kinds of operations on streaming DataFrames/Datasets – ranging from untyped, SQL-like operations (e.g. select, where, groupBy), to typed RDD-like operations (e.g. map, filter, flatMap). See the SQL programming guide for more details. Let’s take a look at a few example operations that you can use. Most of the common operations on DataFrame/Dataset are supported for streaming. The few operations that are not supported are discussed later in this section. You can also register a streaming DataFrame/Dataset as a temporary view and then apply SQL commands on it. Note, you can identify whether a DataFrame/Dataset has streaming data or not by using df.isStreaming. Aggregations over a sliding event-time window are straightforward with Structured Streaming and are very similar to grouped aggregations. In a grouped aggregation, aggregate values (e.g. counts) are maintained for each unique value in the user-specified grouping column. In case of window-based aggregations, aggregate values are maintained for each window the event-time of a row falls into. Let’s understand this with an illustration. Imagine our quick example is modified and the stream now contains lines along with the time when the line was generated. Instead of running word counts, we want to count words within 10 minute windows, updating every 5 minutes. That is, word counts in words received between 10 minute windows 12:00 - 12:10, 12:05 - 12:15, 12:10 - 12:20, etc. Note that 12:00 - 12:10 means data that arrived after 12:00 but before 12:10. Now, consider a word that was received at 12:07. This word should increment the counts corresponding to two windows 12:00 - 12:10 and 12:05 - 12:15. So the counts will be indexed by both, the grouping key (i.e. the word) and the window (can be calculated from the event-time). The result tables would look something like the following. Since this windowing is similar to grouping, in code, you can use groupBy() and window() operations to express windowed aggregations. You can see the full code for the below examples in Scala/Java/Python. Now consider what happens if one of the events arrives late to the application. For example, say, a word generated at 12:04 (i.e. event time) could be received by the application at 12:11. The application should use the time 12:04 instead of 12:11 to update the older counts for the window 12:00 - 12:10. This occurs naturally in our window-based grouping – Structured Streaming can maintain the intermediate state for partial aggregates for a long period of time such that late data can update aggregates of old windows correctly, as illustrated below. However, to run this query for days, it’s necessary for the system to bound the amount of intermediate in-memory state it accumulates. This means the system needs to know when an old aggregate can be dropped from the in-memory state because the application is not going to receive late data for that aggregate any more. To enable this, in Spark 2.1, we have introduced watermarking, which lets the engine automatically track the current event time in the data and attempt to clean up old state accordingly. You can define the watermark of a query by specifying the event time column and the threshold on how late the data is expected to be in terms of event time. For a specific window starting at time T, the engine will maintain state and allow late data to update the state until (max event time seen by the engine - late threshold > T). In other words, late data within the threshold will be aggregated, but data later than the threshold will be dropped. Let’s understand this with an example. We can easily define watermarking on the previous example using withWatermark() as shown below. In this example, we are defining the watermark of the query on the value of the column “timestamp”, and also defining “10 minutes” as the threshold of how late is the data allowed to be. If this query is run in Update output mode (discussed later in Output Modes section), the engine will keep updating counts of a window in the Result Table until the window is older than the watermark, which lags behind the current event time in column “timestamp” by 10 minutes. Here is an illustration. 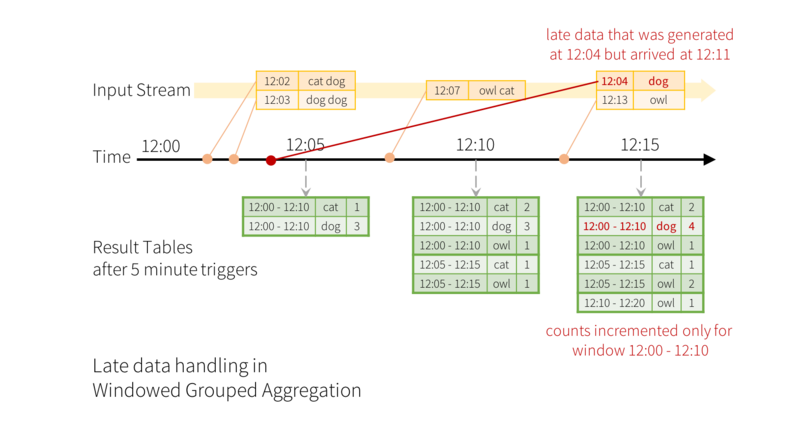 As shown in the illustration, the maximum event time tracked by the engine is the blue dashed line, and the watermark set as (max event time - '10 mins') at the beginning of every trigger is the red line For example, when the engine observes the data (12:14, dog), it sets the watermark for the next trigger as 12:04. This watermark lets the engine maintain intermediate state for additional 10 minutes to allow late data to be counted. For example, the data (12:09, cat) is out of order and late, and it falls in windows 12:00 - 12:10 and 12:05 - 12:15. Since, it is still ahead of the watermark 12:04 in the trigger, the engine still maintains the intermediate counts as state and correctly updates the counts of the related windows. However, when the watermark is updated to 12:11, the intermediate state for window (12:00 - 12:10) is cleared, and all subsequent data (e.g. (12:04, donkey)) is considered “too late” and therefore ignored. Note that after every trigger, the updated counts (i.e. purple rows) are written to sink as the trigger output, as dictated by the Update mode. Some sinks (e.g. files) may not supported fine-grained updates that Update Mode requires. To work with them, we have also support Append Mode, where only the final counts are written to sink. This is illustrated below. Note that using withWatermark on a non-streaming Dataset is no-op. As the watermark should not affect any batch query in any way, we will ignore it directly. Similar to the Update Mode earlier, the engine maintains intermediate counts for each window. However, the partial counts are not updated to the Result Table and not written to sink. The engine waits for “10 mins” for late date to be counted, then drops intermediate state of a window < watermark, and appends the final counts to the Result Table/sink. For example, the final counts of window 12:00 - 12:10 is appended to the Result Table only after the watermark is updated to 12:11. Conditions for watermarking to clean aggregation state It is important to note that the following conditions must be satisfied for the watermarking to clean the state in aggregation queries (as of Spark 2.1.1, subject to change in the future). Output mode must be Append or Update. Complete mode requires all aggregate data to be preserved, and hence cannot use watermarking to drop intermediate state. See the Output Modes section for detailed explanation of the semantics of each output mode. The aggregation must have either the event-time column, or a window on the event-time column. withWatermark must be called on the same column as the timestamp column used in the aggregate. For example, df.withWatermark("time", "1 min").groupBy("time2").count() is invalid in Append output mode, as watermark is defined on a different column from the aggregation column. withWatermark must be called before the aggregation for the watermark details to be used. For example, df.groupBy("time").count().withWatermark("time", "1 min") is invalid in Append output mode. Streaming DataFrames can be joined with static DataFrames to create new streaming DataFrames. Here are a few examples. You can deduplicate records in data streams using a unique identifier in the events. This is exactly same as deduplication on static using a unique identifier column. The query will store the necessary amount of data from previous records such that it can filter duplicate records. Similar to aggregations, you can use deduplication with or without watermarking. With watermark - If there is a upper bound on how late a duplicate record may arrive, then you can define a watermark on a event time column and deduplicate using both the guid and the event time columns. The query will use the watermark to remove old state data from past records that are not expected to get any duplicates any more. This bounds the amount of the state the query has to maintain. Without watermark - Since there are no bounds on when a duplicate record may arrive, the query stores the data from all the past records as state. Many usecases require more advanced stateful operations than aggregations. 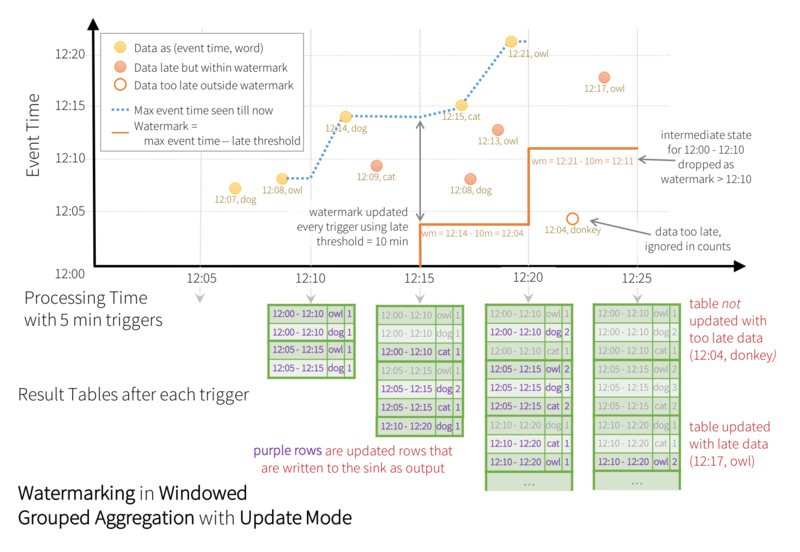 For example, in many usecases, you have to track sessions from data streams of events. For doing such sessionization, you will have to save arbitrary types of data as state, and perform arbitrary operations on the state using the data stream events in every trigger. Since Spark 2.2, this can be done using the operation mapGroupsWithState and the more powerful operation flatMapGroupsWithState. Both operations allow you to apply user-defined code on grouped Datasets to update user-defined state. For more concrete details, take a look at the API documentation (Scala/Java) and the examples (Scala/Java). There are a few DataFrame/Dataset operations that are not supported with streaming DataFrames/Datasets. Some of them are as follows. Multiple streaming aggregations (i.e. a chain of aggregations on a streaming DF) are not yet supported on streaming Datasets. Limit and take first N rows are not supported on streaming Datasets. Distinct operations on streaming Datasets are not supported. 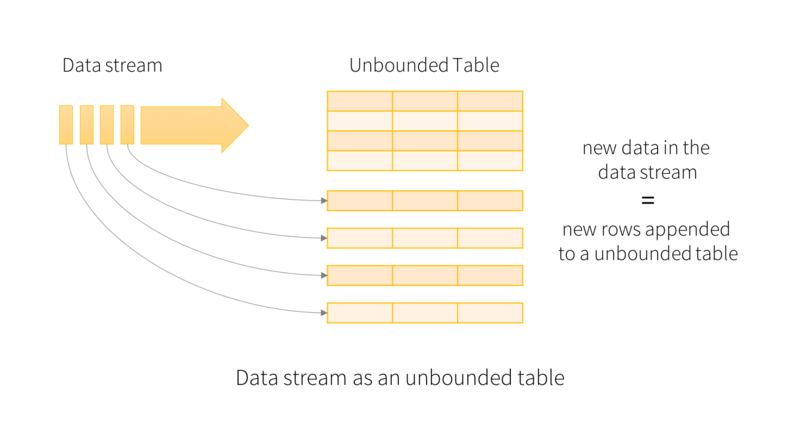 Sorting operations are supported on streaming Datasets only after an aggregation and in Complete Output Mode. Outer joins between a streaming and a static Datasets are conditionally supported. Any kind of joins between two streaming Datasets is not yet supported. In addition, there are some Dataset methods that will not work on streaming Datasets. They are actions that will immediately run queries and return results, which does not make sense on a streaming Dataset. Rather, those functionalities can be done by explicitly starting a streaming query (see the next section regarding that). count() - Cannot return a single count from a streaming Dataset. Instead, use ds.groupBy().count() which returns a streaming Dataset containing a running count. foreach() - Instead use ds.writeStream.foreach(...) (see next section). show() - Instead use the console sink (see next section). If you try any of these operations, you will see an AnalysisException like “operation XYZ is not supported with streaming DataFrames/Datasets”. While some of them may be supported in future releases of Spark, there are others which are fundamentally hard to implement on streaming data efficiently. For example, sorting on the input stream is not supported, as it requires keeping track of all the data received in the stream. This is therefore fundamentally hard to execute efficiently. Once you have defined the final result DataFrame/Dataset, all that is left is for you to start the streaming computation. To do that, you have to use the DataStreamWriter (Scala/Java/Python docs) returned through Dataset.writeStream(). You will have to specify one or more of the following in this interface. Details of the output sink: Data format, location, etc. Output mode: Specify what gets written to the output sink. Query name: Optionally, specify a unique name of the query for identification. Trigger interval: Optionally, specify the trigger interval. If it is not specified, the system will check for availability of new data as soon as the previous processing has completed. If a trigger time is missed because the previous processing has not completed, then the system will trigger processing immediately. Checkpoint location: For some output sinks where the end-to-end fault-tolerance can be guaranteed, specify the location where the system will write all the checkpoint information. This should be a directory in an HDFS-compatible fault-tolerant file system. The semantics of checkpointing is discussed in more detail in the next section. There are a few types of output modes. Append mode (default) - This is the default mode, where only the new rows added to the Result Table since the last trigger will be outputted to the sink. This is supported for only those queries where rows added to the Result Table is never going to change. Hence, this mode guarantees that each row will be output only once (assuming fault-tolerant sink). For example, queries with only select, where, map, flatMap, filter, join, etc. will support Append mode. Complete mode - The whole Result Table will be outputted to the sink after every trigger. This is supported for aggregation queries. Update mode - (Available since Spark 2.1.1) Only the rows in the Result Table that were updated since the last trigger will be outputted to the sink. More information to be added in future releases. Different types of streaming queries support different output modes. Here is the compatibility matrix. Queries with aggregation Aggregation on event-time with watermark Append, Update, Complete Append mode uses watermark to drop old aggregation state. But the output of a windowed aggregation is delayed the late threshold specified in `withWatermark()` as by the modes semantics, rows can be added to the Result Table only once after they are finalized (i.e. after watermark is crossed). See the Late Data section for more details. Update mode uses watermark to drop old aggregation state. Complete mode does not drop old aggregation state since by definition this mode preserves all data in the Result Table. Other aggregations Complete, Update Since no watermark is defined (only defined in other category), old aggregation state is not dropped. Append mode is not supported as aggregates can update thus violating the semantics of this mode. Queries with flatMapGroupsWithState Append operation mode Append Aggregations are allowed after flatMapGroupsWithState. Update operation mode Update Aggregations not allowed after flatMapGroupsWithState. Other queries Append, Update Complete mode not supported as it is infeasible to keep all unaggregated data in the Result Table. There are a few types of built-in output sinks. File sink - Stores the output to a directory. .format("parquet")        // can be "orc", "json", "csv", etc. Kafka sink - Stores the output to one or more topics in Kafka. Foreach sink - Runs arbitrary computation on the records in the output. See later in the section for more details. Console sink (for debugging) - Prints the output to the console/stdout every time there is a trigger. Both, Append and Complete output modes, are supported. This should be used for debugging purposes on low data volumes as the entire output is collected and stored in the driver’s memory after every trigger. Memory sink (for debugging) - The output is stored in memory as an in-memory table. Both, Append and Complete output modes, are supported. This should be used for debugging purposes on low data volumes as the entire output is collected and stored in the driver’s memory. Hence, use it with caution. Some sinks are not fault-tolerant because they do not guarantee persistence of the output and are meant for debugging purposes only. See the earlier section on fault-tolerance semantics. Here are the details of all the sinks in Spark. File Sink Append path: path to the output directory, must be specified. For file-format-specific options, see the related methods in DataFrameWriter (Scala/Java/Python/R). E.g. for "parquet" format options see DataFrameWriter.parquet() Yes (exactly-once) Supports writes to partitioned tables. Partitioning by time may be useful. Memory Sink Append, Complete None No. But in Complete Mode, restarted query will recreate the full table. Table name is the query name. Note that you have to call start() to actually start the execution of the query. This returns a StreamingQuery object which is a handle to the continuously running execution. You can use this object to manage the query, which we will discuss in the next subsection. For now, let’s understand all this with a few examples. The foreach operation allows arbitrary operations to be computed on the output data. As of Spark 2.1, this is available only for Scala and Java. To use this, you will have to implement the interface ForeachWriter (Scala/Java docs), which has methods that get called whenever there is a sequence of rows generated as output after a trigger. Note the following important points. The writer must be serializable, as it will be serialized and sent to the executors for execution. All the three methods, open, process and close will be called on the executors. The writer must do all the initialization (e.g. opening connections, starting a transaction, etc.) only when the open method is called. Be aware that, if there is any initialization in the class as soon as the object is created, then that initialization will happen in the driver (because that is where the instance is being created), which may not be what you intend. version and partition are two parameters in open that uniquely represent a set of rows that needs to be pushed out. version is a monotonically increasing id that increases with every trigger. partition is an id that represents a partition of the output, since the output is distributed and will be processed on multiple executors. open can use the version and partition to choose whether it needs to write the sequence of rows. Accordingly, it can return true (proceed with writing), or false (no need to write). If false is returned, then process will not be called on any row. For example, after a partial failure, some of the output partitions of the failed trigger may have already been committed to a database. Based on metadata stored in the database, the writer can identify partitions that have already been committed and accordingly return false to skip committing them again. Whenever open is called, close will also be called (unless the JVM exits due to some error). This is true even if open returns false. If there is any error in processing and writing the data, close will be called with the error. It is your responsibility to clean up state (e.g. connections, transactions, etc.) that have been created in open such that there are no resource leaks. 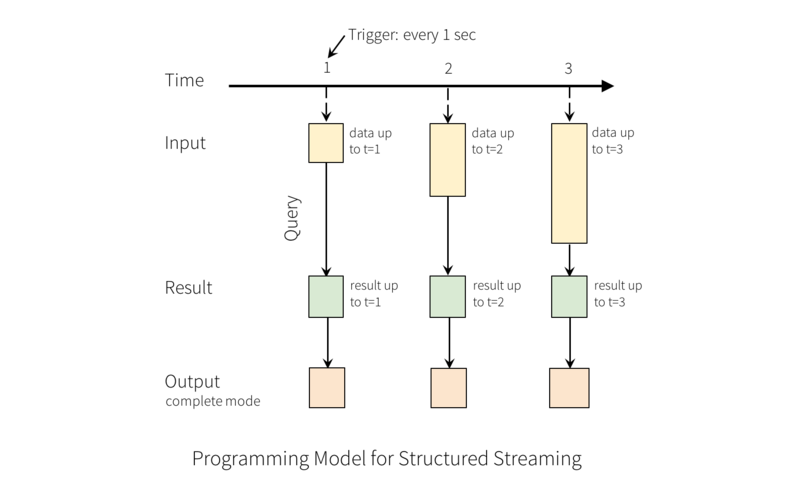 The StreamingQuery object created when a query is started can be used to monitor and manage the query. You can start any number of queries in a single SparkSession. They will all be running concurrently sharing the cluster resources. You can use sparkSession.streams() to get the StreamingQueryManager (Scala/Java/Python docs) that can be used to manage the currently active queries. There are multiple ways to monitor active streaming queries. You can either push metrics to external systems using Spark’s Dropwizard Metrics support, or access them programmatically. You can directly get the current status and metrics of an active query using streamingQuery.lastProgress() and streamingQuery.status(). lastProgress() returns a StreamingQueryProgress object in Scala and Java and a dictionary with the same fields in Python. It has all the information about the progress made in the last trigger of the stream - what data was processed, what were the processing rates, latencies, etc. There is also streamingQuery.recentProgress which returns an array of last few progresses. In addition, streamingQuery.status() returns a StreamingQueryStatus object in Scala and Java and a dictionary with the same fields in Python. It gives information about what the query is immediately doing - is a trigger active, is data being processed, etc. /* Will print something like the following. /*  Will print something like the following. Will print something like the following. Spark supports reporting metrics using the Dropwizard Library. To enable metrics of Structured Streaming queries to be reported as well, you have to explicitly enable the configuration spark.sql.streaming.metricsEnabled in the SparkSession. All queries started in the SparkSession after this configuration has been enabled will report metrics through Dropwizard to whatever sinks have been configured (e.g. Ganglia, Graphite, JMX, etc.). In case of a failure or intentional shutdown, you can recover the previous progress and state of a previous query, and continue where it left off. This is done using checkpointing and write ahead logs. You can configure a query with a checkpoint location, and the query will save all the progress information (i.e. range of offsets processed in each trigger) and the running aggregates (e.g. word counts in the quick example) to the checkpoint location. This checkpoint location has to be a path in an HDFS compatible file system, and can be set as an option in the DataStreamWriter when starting a query. See and run the Scala/Java/Python/R examples.